1 of 2 Heat oven to 450 degrees . In a medium-size bowl, stir together chicken, cheese, onion and taco seasoning. Stir in cilantro, if desired. 2 of 2 Place 2 tortillas on baking rack over a baking sheet. Spread 1 heaping cup of chicken mixture over each tortilla. Top each with another tortilla and press down gently. 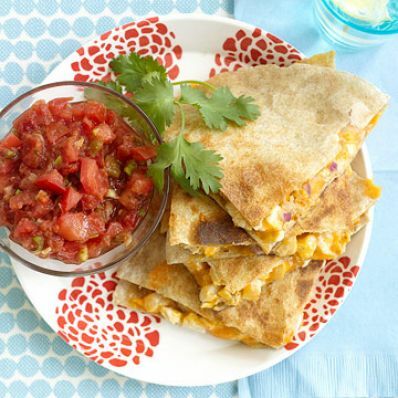 Bake quesadillas at 450 degrees for 8 minutes or until cheese has melted. Cut into quarters and serve with salsa, if desired. Per Serving: 25 g carb., 8 g Fat, total, 264 kcal cal., 22 g pro., 854 mg sodium, 2 g fiber, 2 g sat. fat, 45 mg chol.